Solute properties are known to be strongly influenced by solvent molecules due to solvation. 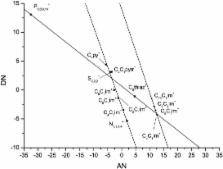 This is due to mutual interaction as both the properties of the solute and of the solvent strongly depend on each other. The present paper is based on the idea that ionic liquids are cations solvated by anions and anions solvated by cations. To show this (in this system strongly pronounced) interaction the long time established donor–acceptor concept for solvents and ions in solution by Viktor Gutmann is extended to ionic liquids. A number of solvent parameters, such as the Kamlet–Abboud–Taft and the Dimroth–Reichardt ET scale for ionic liquids neglect this mutual influence, which, however, seems to be in fact necessary to get a proper description of ionic liquid properties. It is shown how strong such parameters vary when the influence of the counter ion is taken into account. Furthermore, acceptor and donor numbers for ionic liquids are presented. How ionic are room-temperature ionic liquids? An indicator of the physicochemical properties. Room-temperature ionic liquids (RTILs) are liquids consisting entirely of ions, and their important properties, e.g., negligible vapor pressure, are considered to result from the ionic nature. However, we do not know how ionic the RTILs are. The ionic nature of the RTILs is defined in this study as the molar conductivity ratio (Lambda(imp)/Lambda(NMR)), calculated from the molar conductivity measured by the electrochemical impedance method (Lambda(imp)) and that estimated by use of pulse-field-gradient spin-echo NMR ionic self-diffusion coefficients and the Nernst-Einstein relation (Lambda(NMR)). This ratio is compared with solvatochromic polarity scales: anionic donor ability (Lewis basicity), E(T)(30), hydrogen bond donor acidity (alpha), and dipolarity/polarizability (pi), as well as NMR chemical shifts. The Lambda(imp)/Lambda(NMR) well illustrates the degree of cation-anion aggregation in the RTILs at equilibrium, which can be explained by the effects of anionic donor and cationic acceptor abilities for the RTILs having different anionic and cationic backbone structures with fixed counterparts, and by the inductive and dispersive forces for the various alkyl chain lengths in the cations. As a measure of the electrostatic interaction of the RTILs, the effective ionic concentration (C(eff)), which is a dominant parameter for the electrostatic forces of the RTILs, was introduced as the product of Lambda(imp)/Lambda(NMR) and the molar concentration and was compared with some physical properties, such as reported normal boiling points and distillation rates, glass transition temperature, and viscosity. A decrease in C(eff) of the RTILs is well correlated with the normal boiling point and distillation rate, whereas the liquid-state dynamics is controlled by a subtle balance between the electrostatic and other intermolecular forces. Effects of low ionic strength media on passive human red cell monovalent cation transport.